Faithful Alameda History blog readers will know that protests were not uncommon in the early years of our neighborhood life, usually around schools and churches, and frequently about land use topics. Property owners had sought out this subdivision for many reasons, including a covenant that prohibited all but residential development within the Alameda Park plat proper. You couldn’t build a store or office. You could barely build a church, as we have seen. Want to build a campground, or as they were known during the day, an auto camp? Forget it. This neighborhood was definitely not buying any such proposal. Our timeframe for this vignette is the mid 1920s. We’ll remember that at this point, Alameda Park is experiencing exponential growth…the previous few years outpacing all other years combined. There was much new construction, but still many vacant lots, some brush fields, and a sense that while we were the “Tuxedo of Portland,” as claimed in the real estate development ads, we were still on the outskirts of Portland. That’s when our predecessors first learned about a proposal to build an auto campground right here on our doorstep at 33rd and Mason. The 15-acre wooded parcel that is today’s Wilshire Park was then part of the Jacob Kamm estate. Kamm (1823-1912) was one of Portland’s wealthiest residents, making his fortunes in the steam navigation business. He also dabbled in real estate investment and had strategically purchased parcels downtown and at the edges of Portland, including the 15 acres of woods just north of the Alameda Ridge. When he died in 1912, his estate was valued at $4 million. Sorting out the estate took years and was frequently in the press. Up here in Alameda, Kamm’s trees kept growing. 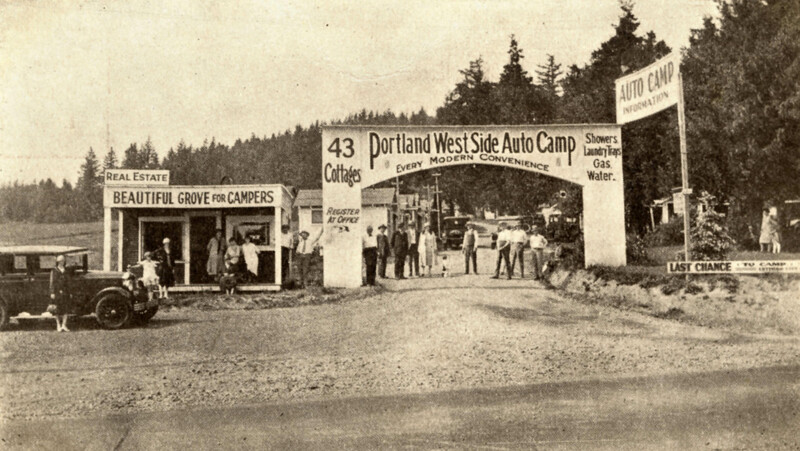 Tourist parks or auto camps were not that uncommon here in Portland and elsewhere. The car was a new toy and tool, and as people traveled the countryside, they needed a place to land temporarily as they explored the area. Think of a KOA campground. Let’s just say that auto camps were in the public consciousness of the day: an enjoyable, convenient and necessary extension of car travel. 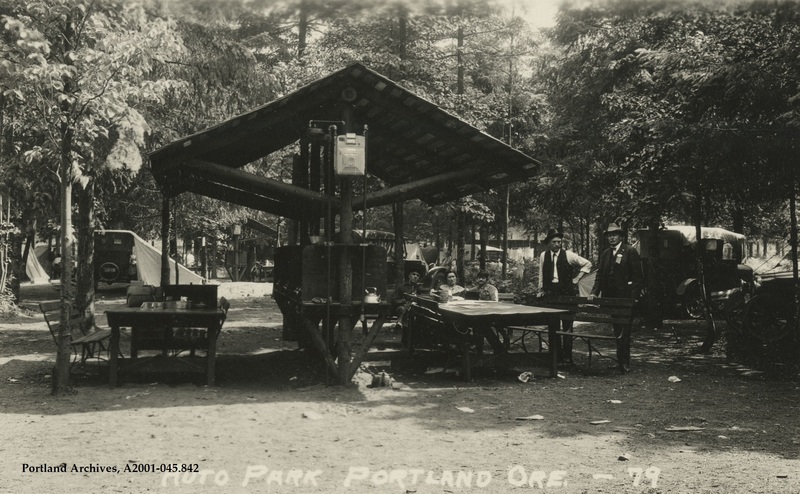 Here’s a photo from the City of Portland Archives showing one such camp in 1925, somewhere on the Westside. Faced with a petition and local uproar, City Council had to schedule some time to let Alameda vent and make its case. Below, in the story the next day, October 8, 1920, check out the fourth paragraph, where a description of Alameda’s winding streets, considered an asset by some developers, is spun as a liability when it comes to serving the needs of the traveling public. In the following day’s story, with some plausible deniability and backpedalling by Pier, City Council quickly reversed direction on the plan and endorsed the neighborhood notion of playgrounds and open parks. Eventually, the city found property and built an auto park near Peninsula Park in the vicinity of Ainsworth and Albina. Here’s another photograph. The topic of the Kamm Estate goes quiet then, resurfacing six years later in the September 10, 1926 edition of The Oregonian (below)as one of several city park needs being considered. It would take another seven years until 1933—with the property still connected to the Kamm estate—that the city would seriously consider the idea.